Atka mackerel (Pleurogrammus monopterygius) is a schooling, semi-demersal species distributed from the east coast of the Kamchatka Peninsula, Russia, throughout the Komandorskiye and Aleutian Islands, north to the Pribilof Islands, and eastward through the Gulf of Alaska to Southeast Alaska. Their center of abundance has been in the Aleutian Islands region, particularly from Buldir Island to Sequam Pass. Atka mackerel begin to recruit to the fishery at age 2 and many survive to 14 years. Fifty percent of the female population is estimated to have reached maturity at 31 cm (about 3.6 years old). Atka mackerel migrate from the shelf edge to shallow coastal waters (5-30 m) to spawn. 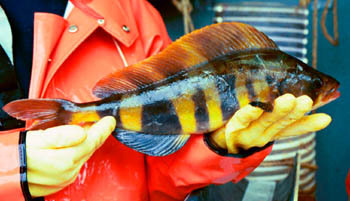 Spawning occurs in July -September along the Aleutian Islands. Eggs are adhesive and deposited in rock crevices. These nest are guarded by the males until hatching, which occurs about 40-45 days later. Atka mackerel eat copepods and euphausiids and, in turn, are prey for other fish, seabirds, Steller sea lions, and other marine mammals. trawling occurs almost exclusively at depths less than 200 m.
McDERMOTT, S. F., D. W. COOPER, J. L. GUTHRIDGE, I. B. SPIES, M. F. CANINO, P. WOODS, and N. HILLGRUBER. 2011. Effects of maternal growth on fecundity and egg quality of wild and captive Atka mackerel. Mar. Coastal Fish. 3:324-335. (.pdf, 848 KB). Online. RAND, K. M., and S. A. LOWE. 2011. Defining essential fish habitat for Atka mackerel with respect to feeding within and adjacent to Aleutian Islands trawl exclusion zones. Mar. Coastal Fish. 3:21-31. (.pdf, 1.39 MB). Online. COOPER, D., and S. McDERMOTT. 2011. Seasonal, small-scale distribution of Atka mackerel in the Aleutian Islands, Alaska, with respect to reproduction. Mar. Coastal Fish. 3:10-20. (.pdf, 2.35 MB). Online.